Mahatma Gandhi was assassinated on October 30, 1948. Japan launched a nuclear attack on the United States during World War II. A new country named ‘Islamic Islamabad’ was constituted after Partition with its capital at ‘Khyber Ghat’ in the Hindu Kush mountains. All South Indians are ‘Madrasis’. These aren’t examples of bloomers from some third-rate tourist guidebook, but gems from history in social science textbooks that have been fed to 50,000 Class 6-8 students of government-run English-medium schools in Gujarat. The textbooks were put together by a panel of experts from the Gujarat Council of Educational Research and Training (GCERT) and Gujarat State Board for School Textbooks (GSBST), who decide the curriculum. These were the same textbooks in which a chapter on the life and times of Prime Minister Narendra Modi was proposed, only to be shot down by the BJP leader himself. The state government has woken up and appointed a panel of experts drawn from private schools to review and revise these textbooks. Official sources say new and revised textbooks will be out in the market in time for the new academic session. The error-ridden books have, however, been used to teach impressionable students till now. Mistakes and bloomers weren’t the only problems with the textbooks. Instances of what social scientist Achyut Yagnik calls the “intellectual poverty” of the textbooks’ anchors abound. It says the majority of people in eastern India reside in “houses made of wood and bamboo”. In another reference, it goes on to club the Rath Yatra of Puri with South Indian festivals, including Onam and Diwali in Kerala. English hasn’t been spared either. Here’s a sample from the Class 6 textbook: “You might have heared, read and seen that the Earth is round. Whereas, you stay on the Earth, you can not come to know the shape of Earth; because the Earth is too much vast. That these textbooks are translated from their Gujarati equivalents, and poorly at that, stands out. The base material, he said, is always in Gujarati and the translators are of poor quality. Yagnik also points to the lopsidedness of these books. 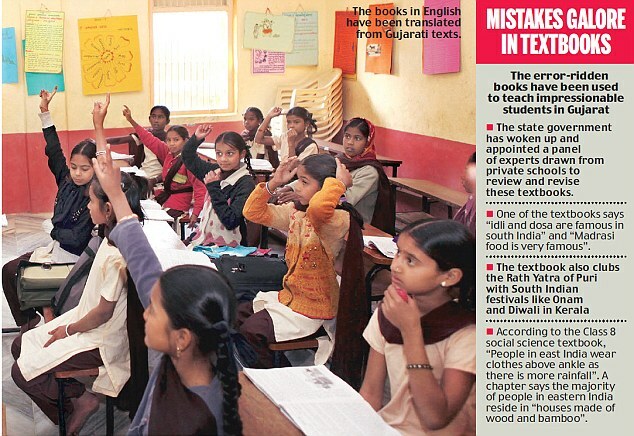 “The National Curriculum Framework 2005 was never implemented by Gujarat and there is a political bias here. For instance, the GCERT-engineered textbooks have only one paragraph on the 350 years of Mughal rule in India,” said Yagnik. Speaking to Mail Today, he cited the first semester textbook of Class 7 that contains a chapter on the medieval age but has just a paragraph on Mughal rule. The chapter devotes itself largely to how Mahmud of Ghazni looted “India and Saurashtra (in Gujarat)”. Afraid to take your Caste share of land from India and build your own nation?